“You do realise there are only 21 weeks until we start playing Christmas carols on the radio, don’t you?” So said a colleague of mine other day, much to the consternation of everyone else in the office. The passage of time is something I’ve been reflecting on recently: next week, I’ll have been working at my company for ten years – and shortly after, it’s my ninth wedding anniversary (mental note to self: your dad’s decision to buy your mum a bumper roll of cling film as a gift is not an example that should ever be followed). But the thing that’s really made me feel old is the fact that tomorrow, my son celebrates his sixth birthday. Exactly six years ago to the minute, my wife and I were sitting in our little one-bedroomed flat, trying to decide whether or not to go into hospital again. Mrs J had already been in labour for about twelve hours; we’d made a trip to St. George’s in Tooting once already but instead of being told to push, my wife was instructed simply to go back home and have a bath. Nearly 24 hours after that, our son finally arrived into the world; a tiny, fragile, beautiful little baby whose existence changed the shape of our family forever. Fast forward on to today, and this little bundle of vulnerability has become a football-playing, practical joke-making, inquisitive boy, who recently wrote on his school report that his target for next year is “to persevere with difficult things a bit more” (I don’t think I could even spell persevere correctly until I was doing my GCSEs). My son is closer to being in double figures than he is to the day of his birth – and, without wanting to wish his childhood away, I’d imagine his teenage years will be here quicker than you can say “it’s SO unfair, Dad” and slam the door behind you in a fit of misunderstood angst. I hope I get the privilege of seeing my boy celebrate a great many more birthdays. But no matter how old he gets, there’ll always be a part of me that still thinks of him as that 8-pounds-and-12-ounces new creation, blinking at his first experience of daylight and calmly lying on his mum’s chest, starting to take stock of the world around him. Happy birthday, lad. You’re going to have a great time being six, and I’m going to keep on having even more fun being your dad. Just don’t get any older too quickly. 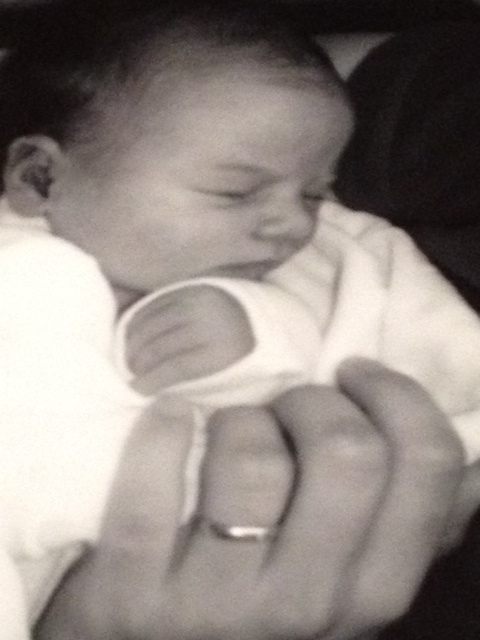 My fabulous Dominic, 8lbs 7oz bundle of joy was 16 on 9 July. He carries the shopping, pushes the trolley, unpacks the car, helps walk the dogs and all in all, I love him at this age! Seems two minutes ago since he was 6, the time has flown and every stage has had its own pluses. Enjoy!